Famously the Ancient Greek aphorism “know thyself” was inscribed at the Temple of Apollo in Delphi, but it may be the myth of Prometheus which can best reveal the manifestation of our four universal functions; body, mind, soul and heart. As with most of the major myths there are several variations on the Prometheus archetype. Most tell of his daring theft of fire to give to mankind, thereby risking the wrath of Zeus and yet the most insightful version reveals his central part in the creation of humankind itself and in shaping the very nature of our being. Prometheus was an immortal; his name literally meaning forethought or foresight and along with his brother Epimetheus, meaning hindsight, they were given the task of populating Earth. However Epimetheus being true to his name gave all of the best attributes; such as strength and speed to the animals and so it fell to Prometheus, the prototype inventor to fashion man with his singular ingenuity. His first instinct was to take the earth itself representing the element of body and mix it with the equally ubiquitous water representing the element of mind to create a man of clay. While physical, his creation lacked animation and so he beseeched the goddess of wisdom to bestow her most special gift upon his creation. Athena answered his pleas and sent down her butterfly which was symbolic of the very air that bore it’s wings and anointed his creation with an eternal soul to go with its impermanent body and mind. Alas, this was still not enough and so Prometheus approached Zeus. the ruler of the gods in the hope of receiving the eternal fire representing the element of heart that burned exclusively at Mount Olympus. Zeus was adamant that such a gift would be too powerful for mere mortals and so Prometheus was denied. Undeterred Prometheus decided to steal the vital spark of life itself from the sacred fire that burned at the heart of Zeus’s temple. Finally satisfied, Prometheus surveyed his now complete human being comprised of the physical and the metaphysical; human of body and mind and being of heart and soul. When Zeus discovered this unprecedented act of betrayal he decided to punish the immortal Prometheus for his impertinence in a very mortal fashion. The unsuspecting Prometheus never saw it coming for while he was the god of foresight, he somehow lacked the ability to foresee his own destiny and so Zeus had him captured and chained for all eternity to a Mountain in the Caucasus. Prometheus could not be killed but this did not stop Zeus from ensuring that in the image of his beloved mortal creation he would be bound to the earth but in his case, for all time. Zeus then added a very specific daily torture when he instructed his great Eagle, symbol of his voracious mind to descend upon the Earth as body to rip out and devour the liver representing the soul of Prometheus. Zeus had concocted a living hell for Prometheus that was symbolic of mortal mans daily existence with the competing functions of body, mind and soul. Only every night the immortal’s liver would regenerate and the whole ghastly ritual would continue without end. As an aside it is a remarkable testament to the ancient Greeks knowledge that they intuited that the liver was capable of regeneration and self-repair. 30,000 years passed and Zeus fell in love with Io, a nymph and priestess to his wife Hera and so he seduced her. To keep Hera from discovering his infidelity he took the precaution of covering the world with a thick blanket of clouds. This tactic only served to arouse Hera’s suspicions and so she came down from Mount Olympus and began dispersing the clouds. Zeus was panicked and quickly changed Io’s form from that of a beautiful maiden into a white heifer and so when Hera arrived to find Zeus standing beside the bovine beast he swore that he had never seen the cow before, it had just sprang right out of the earth. Immediately perceiving his deceit, Hera complemented the cow and asked to have it as a present. Zeus was dumbfounded and could not turn down such a reasonable request without giving his game away. Reluctantly Zeus presented Hera with the metamorphosed Io. Hera hid the enchanted cow away and arranged for Argus to watch over it. Argus made the best of watchman for he had a hundred eyes and could have some of them sleep while others lay awake. A desperate, Zeus soon sent Hermes to rescue his beloved Io. Disguised as a Shepard, Hermes had to employ all his skill as a musician and story teller to gain Argus confidence and lull him to sleep. Once asleep, Hermes killed Argus. Hera would mourn this treacherous act and as a memorial, she took his eyes and set them into the tail of her favourite bird, the peacock. Although Io was now free, Hera instructed the mother of all gad-flys to pursue and sting her poor bovine form while the ghost of Argus plagued her every step. Io was pushed close to madness as she wandered the world in a pointless bid to escape this purgatory. On her seemingly pointless wanderings she came upon Prometheus still bound to his chains. Prometheus had his own daily hell to deal with and yet he found it in his own heart to muster enough compassion to give the desperate Io a glimmer of hope. For while his uncanny foresight still predicted that she would have to wander for many years to come. She would eventually be changed back into human form and would bear a child. A child whose own descendent would one day perhaps become the greatest of heroes. Miraculously his predictions came true and on her wanderings many geographical features were named after Io including the Ionian Sea, and the Bosphorus meaning ford of the cow. Eventually she would reach the Nile where Zeus once more could restore her to human form. As destined she bore Epaphus and eleven generations passed before his descendant, the great Hercules was born. Hercules would endure many trials on one of which he would break the supposed eternal bonds that had held Prometheus and set him free. Prometheus had suffered for his own original sin as if for the whole of humanity. The human condition is to suffer, for we are all bodily chained to the surface of this planet and carry our mortal sins for the term of our mortal lives. The eagle of our own minds which can so often deal in the daily lies and untruths of existence devours the eternal truth of our souls. Our minds grown weary and satisfied must sleep at night or while in meditation enabling our eternal soul to regenerate once more. As this myth has shown, all journeys both begin and end in the heart. In this case the journey toward redemption began for Prometheus when he knelt at the hearth in Mount Olympus and stole from the eternal fire of pure heart. It also ended with the consequences of his heart felt gesture of compassion toward the deeply troubled Io. Such is karma. It is also important to understand that Zeus’s own infidelity ultimately set in motion the conditions for Prometheus’s resurrection. Prometheus has sometimes been called the prototype Christ for his long suffering on behalf of humanity. Many forget that there are at least two references in the scriptures to Christ’s own descent into hell following the Crucifixion, a matter of no small consequence in bringing about redemption, as the reflexive Octave within the Meta Model infers. Therefore we must first descend from freedom to a fully bound determinism before we can ascend to a new found freedom and know the place for the first time. The most confounding problems in life cannot be solved with our old psyches. 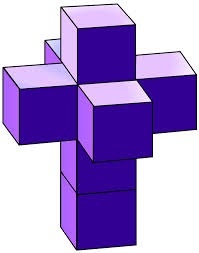 Yet following a full inversion we shall find that we have outgrown the impenetrable problems of life that previously bound us and they shall no longer own us…. The Prometheus myth may show us the accumulation of material complexity in our four functions which we call involution. While the myth of the great Theseus equally shows the accumulation of functional complexity which we call envolution when these four functions engage on an epic quest. Theseus was the mythical founder-king of Athens, son of Aethra, and fathered by Aegeus and Poseidon. He was born of a special Mandorla, one mortal father, and one immortal, signifying both the physical and the metaphysical or whole-brain thinking. He was the archetype of pure presence. The courageous heart driven hero defined by his nemesis the Minotaur. The covert archetype of bodily fear representing pure absence. It is not a coincidence that the man bull bodily monster alludes to the earth sign of Taurus while the lion heart of Theseus alludes to the fire sign of Leo. Pasiphae, wife of King Minos of Crete, had several children before the Minotaur. The eldest of these, Androgeus, set sail for Athens to take part in the Pan-Athenian games which were held there every five years. Being strong and skilful, he did very well, winning some events outright. He soon became a crowd favourite, much to the resentment of the Pallantides and they assassinated him, incurring the undying retribution of Minos. When King Minos heard what befell his son, he ordered the Cretan fleet to set sail for Athens. Minos asked Aegeus for his son’s assassins, and if they were handed to him, the town would be spared. However, not knowing who the assassins were, King Aegeus surrendered the whole town to Minos’ mercy. However, Minos’s recompense for the life of his son was to cost the Athenians dearly. He demanded that at the end of every Great Year of seven solar years, the seven most courageous youths and the seven most beautiful maidens were to board a boat and be sent as tribute to Crete, never to be seen again. On the third occasion, Theseus came of age and with his great and courageous heart he volunteered to slay the monster. He took the place of one of the youths and set off with a black sail, promising to his father, Aegeus, that if successful he would return with a white sail. Like the others, Theseus was stripped of his weapons when they sailed. On his arrival in Crete, he recognised the soulful Ariadne as his anima. She was King Minos’ daughter, but this could not stop her from falling in love with the bold Theseus. Her great soul would be his guide and so she secretly passed Theseus the fateful ball of thread that would safeguard his descent into her Father King Minos, mind maze of lies and safely back again. That night, Ariadne escorted Theseus to the Labyrinth, and Theseus promised that if he returned from the Labyrinth he would take Ariadne with him. As soon as Theseus entered the Labyrinth, he tied one end of the ball of thread to the door post. The Oracle had prophesised that the Minotaur’s embodiment of pure fear could never be slain by shield, sword or spear; symbolic of body, mind and soul and so Theseus carried nothing but his great heart within his great chest. Theseus also had instructions from the intuitive Ariadne as his soul guide to go forwards, always down and never left or right so that he would not reveal any absence through his doubting. Theseus soon came to the heart of the Labyrinth and also upon the sleeping Minotaur who could only smell fear. The beast awoke and a tremendous fight then occurred. 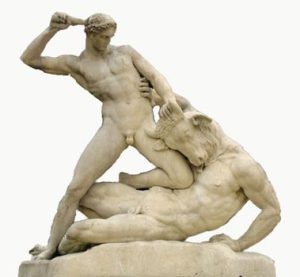 Theseus overpowered the Minotaur with his naked strength and killed the beast with his bare hands, the ultimate in courageous acts. For only pure presence could reveal the illusion of pure absence. Had Theseus doubted his own presence and sought to arm and protect himself with shield, sword or spear then it would have proved fatal for he would only have revealed the fear born of absence that would have fed the monsters might. 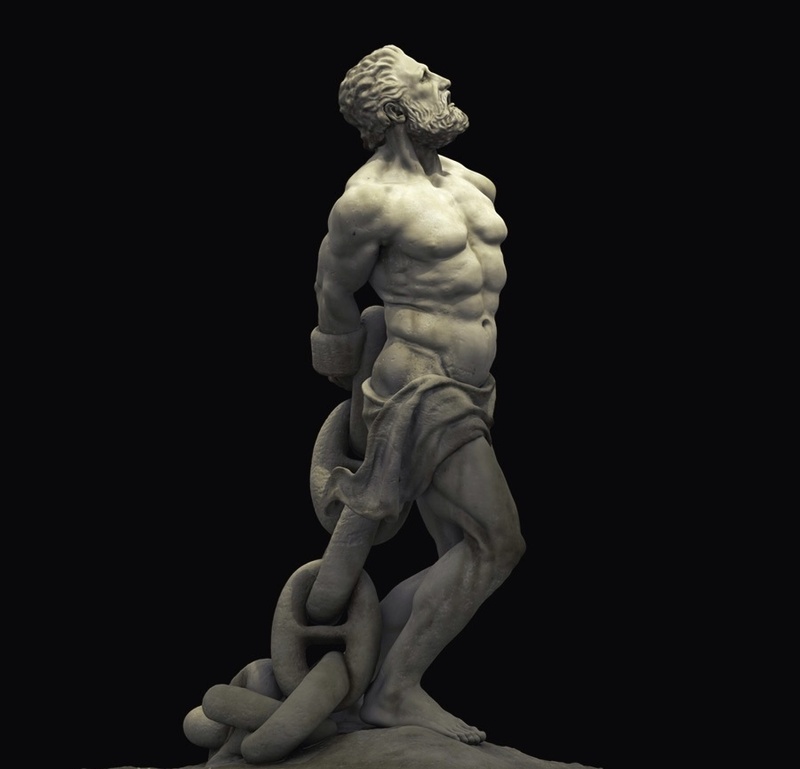 After defeating the beast, Theseus used the intuitive thread of truth to escape the mind maze of lies that had hidden the bodily fear that his heart had vanquished. His heroics did not stop there as he also managed to escape with all of the young Athenians and Ariadne. Then he and the rest of the crew fell asleep on the beach. Athena goddess of wisdom wakes Theseus and tells him to leave early that morning. Athena tells Theseus to leave Ariadne on the beach. Stricken with distress, Theseus forgot to put up the white sails instead of the black ones, so the king committed suicide. His father’s suicide may be seen as karmic retribution for not having the courage to defy King Minos in the first place. At any rate, having delivered them into freedom, Theseus proved himself to be the true King of the Athenians. The Promethean journey is the story of the first half of life to descend and fully accumulate and integrate the four functions of our being as an involution. The heroic journey of Theseus is the story of our second half of life when we as integrated psyches achieve our purpose and secure our own freedom and that of others to ascend. Unlike involution’s accumulation of ego functions the ascent to personal freedom and self actualisation of the self requires instead the dissipation of functions. In this process Theseus had to lose his own Father’s life and Ariadne’s love. One was symbolic of his past while the other was of his future so that he could remain in the present and be fit to rule the kingdom on his return…. Maria certainly knew a thing or four, so much so that the Arabs bestowed her the honourific, Plato’s Daughter. However I have taken the liberty of inserting NEW into her axiom. The ‘new one as the fourth’ more accurately describes our findings with the Meta Model for Process. 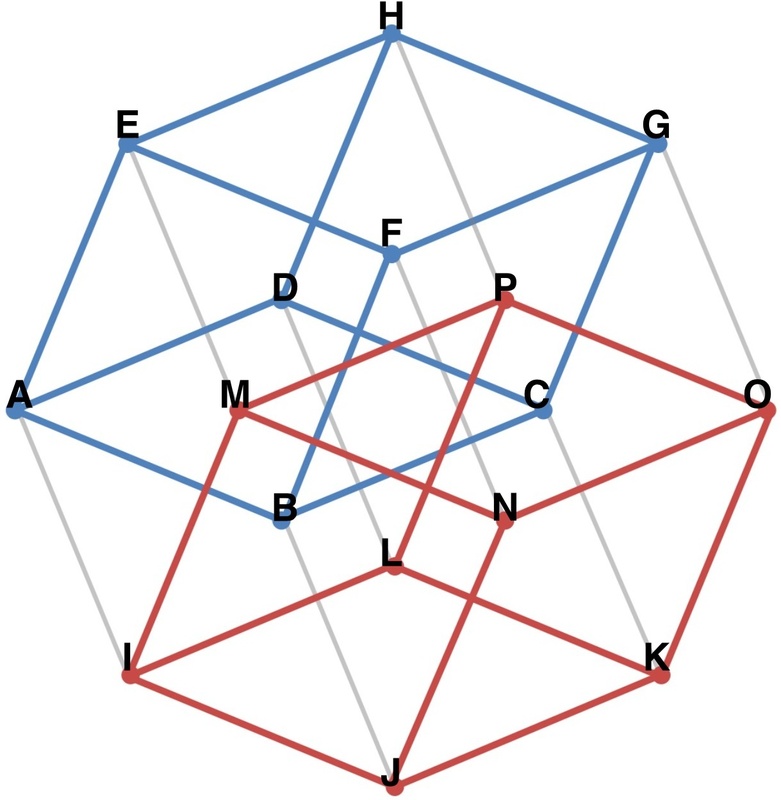 Namely, that the fourth order effect is the heart which transcends the other three. Taking Space-time as an example, our one temporal dimension is the heart of the three spacial dimensions; bringing them all to life! The new one that enables progression to occur. 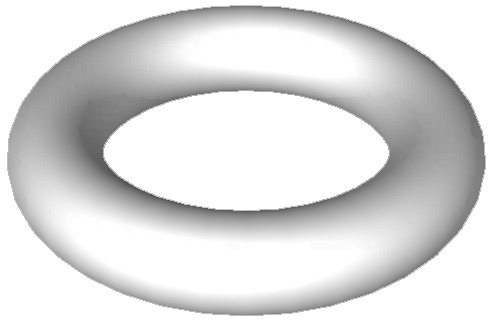 Without it, the third order effect of spacial dimensions (x,y,z) only allows for presentation. The biosphere is also a fourth order effect allowing progression between it’s three sub-spheres which can all come together to sustain life in it’s many different forms. 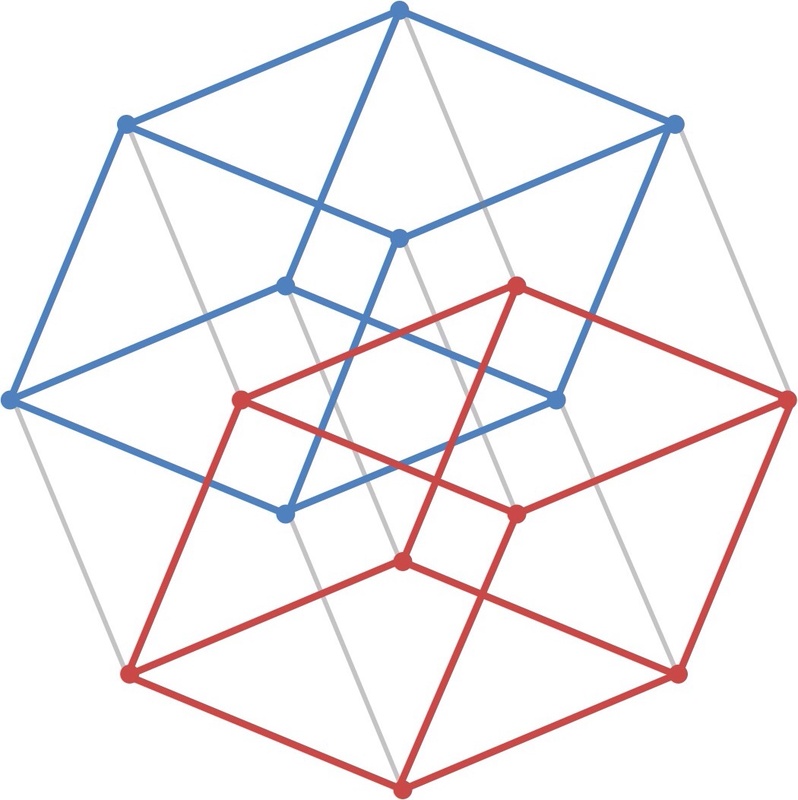 As predicted by the Meta Model; the biosphere is a three into one phenomenon. The biosphere can be seen as the summation of its three sub-sphere’s which is greater than its parts. When meta modelling we use the meta tags of body, mind, soul and heart, to assign the first through to the fourth order effect respectively. They are also useful to keep a track as you move up and down levels of abstraction and layers of interaction. 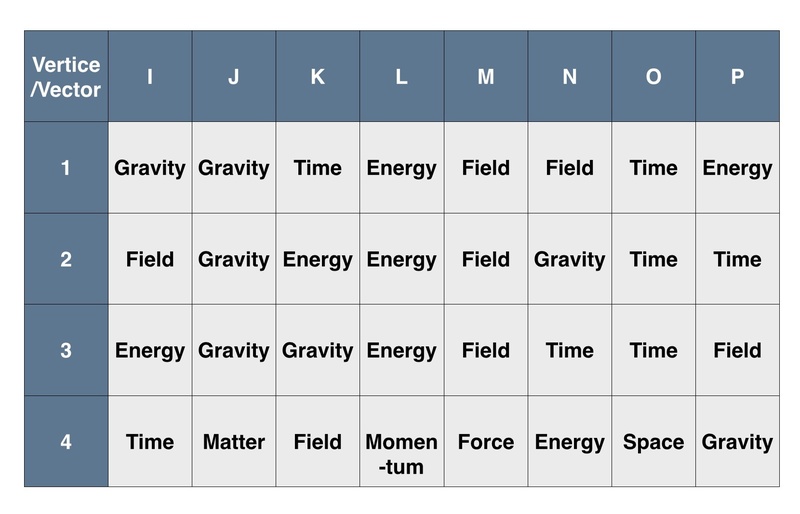 The table above demonstrates the utility of the meta tags when observing stages of Involution, increasing material complexity, or of Envolution, increasing functional complexity; in this case four examples of Envolution are shown. 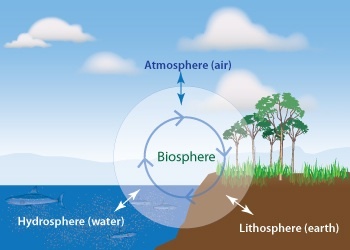 As a form of envolution, the biosphere also presents as an accumulation of functional complexity; The lithosphere presents as land masses that are separated until the hydrosphere connects them, while the atmosphere connects both the lithosphere and the hydrosphere simultaneously. 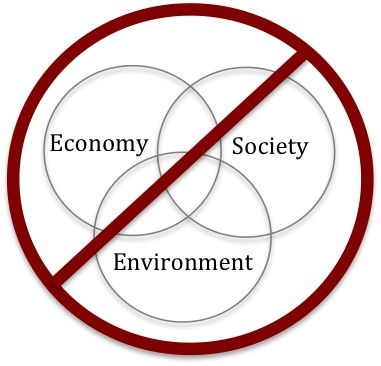 Finally the biosphere is the unification of all three of these functional domains. The biosphere then can be considered the global eco-system which houses all other eco-systems. The biosphere eco-system also provides a great analogy to a ‘Trust-sphere’ eco-system or ‘equ-system’ for the proliferation of data as an analogy to the proliferation of life. An equ-system, like any true partnership or relationship exchange should be imbued with trust. For that to occur there should be no gradient (asymmetric information) relationship between any two parties within the system. – Attention (Push/Advertising) reflexes to Intention (Pull/Casting). VRM (Vendor Relationship Management) tools provide customers with both independence from vendors and better ways of engaging with vendors. The same tools can also support individuals’ relations with schools, churches, government entities and other kinds of organizations. Returning to the biosphere analogy where the biosphere and trust-sphere both equate as heart / heart. We can take the notion that the lithosphere (infra-sphere) comprises continents (CSP utilities) or Islands (DIY Clouds) that are separate and associate it with the trust-sphere’s infrastructure layer of data utilities; both lithosphere and infra-sphere equate as body / body. In turn the lithosphere’s continental land masses (CSP utilities) are connected by the hydrosphere’s Oceans (Open Identity Exchanges) which also associates nicely with the trust-sphere’s ‘Execution’ and governance layer allowing content to move freely between the continents (CSP utilities); both hydrosphere and exec-sphere equate as mind / mind. Lastly the atmosphere as the ‘Enterprise’ layer adds value as it sits above both and absorbs water (data) by the process of evaporation from the hydrosphere (OIX’s), transporting and depositing it back onto the lithosphere’s (CSP utilities) as precipitation (data content) which can then return it to the hydrosphere’s Oceans (OIX’s) via lakes and rivers to be recycled. Or it can store the precipitation (data content) which can be likened to percolation back into the water table of the lithosphere (CSP as storage). 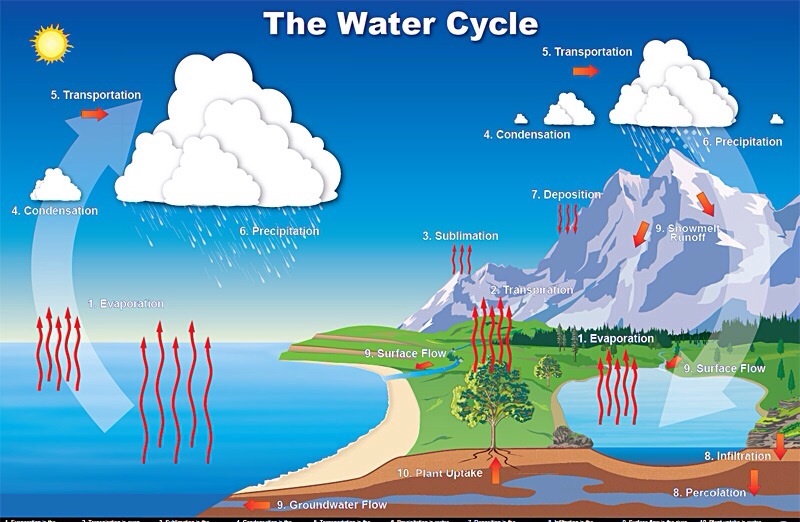 The processes of sublimation and transpiration that occur on the lithosphere (CSP utilities) also allow the atmosphere (enterprise layer) to absorb water (data) and transport it back to other regions of the lithosphere (CSP utilities) or hydrosphere (OIX’s); both atmosphere and enter-sphere equate then as soul to soul. Admittedly if a data trust-sphere as an entire global equ-system is to emerge, it will no doubt require a lot of resources and cooperation. Yet we only have to look back a generation to see the enormous development that has given rise to our current form of internet. Will be in ensuring that the three sub-spheres cannot contaminate or corrupt one another and that each sub-sphere maintains a sizeable community engaging in healthy competition much as the biosphere does between life forms within it. Therefore each sub-sphere will require its own specialisation of cultures, technologies, policies and economic models. In essence we do not need another controlled eco-system, we have that now; what we do need is a collaborative one so we as individuals can remain in control of our sovereign data rights. Are you ready to trust in a new future? It may not be utopian but it will be tritopian which will be essential if we are to support all life in trust by avoiding our current growing dystopia of data haves and have nots! This article was written by Brian Grimmer, Founder & CEO of Present Group, with insights and understandings derived from extensive cooperation with Peter Midgley, CXO of Present Group on the Meta Model for Process. The terms ‘Trust-sphere’, ‘Equ-system’, ‘Enter-sphere’, ‘Exec-sphere’ and ‘Infra-sphere’ are new terms to have emerged while meta modelling a data eco-system to be analogous to the biosphere. For years I have considered the interrelationship between power and strength. We so often hear the term ‘an abuse of power’ but never have I heard the term ‘an abuse of strength’ before. In recent history, one of the most visual and striking examples of these two forces of nature facing off against one another, was the instance of “Tank Man”. 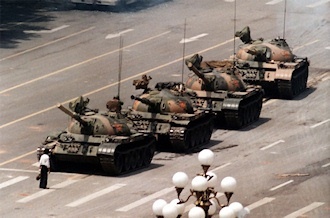 When a lone figure in Beijing, temporarily stopped the advance of a column of tanks on June 5, 1989, in what is widely considered one of the iconic images of the 20th century. The anonymous man who stood in front of a column of tanks that morning after the Chinese military had suppressed the Tiananmen Square protests by force, achieved widespread international recognition. Some have identified the man as Wang Weilin, but the name has not been confirmed and little is known about him or of his fate after the confrontation. So why did such a show of concentrated military power yield to a lone and defenceless student carrying nothing more than a shopping bag? We can all understand power versus power confrontations. For instance think of the Cold War deadlock between the super powers of capitalism and communism, or WW2 when the free democratic ‘Allies’ united in defence against the totalitarian fascist ‘Axis’ powers. Equally, strength versus strength show downs which capture our attention are also easily understood. These are the preserve of accomplished and driven individuals pitting their wits and courage and in some cases their very lives against each other in a bid for glory or immortality. Think of the great tennis, racetrack, political, or business rivalries. Or any other concentrated arena where the limits of human skill, resilience and endurance are on full show. But it is the David and Goliath, strength versus power struggles such as the one witnessed in Tiannaman Square that day that continue to intrigue me the most. So why does power appear to present more often in collectives and strength in individuals apart from the obvious inequality of resources that they each possess? And even then, why does collective power so often yield to individual strength? Fundamentally, what is it that majority power lacks, that minority strength has to it’s distinct advantage? Perhaps, a vital insight has come from my own experience with customer surveys over the years. At Present Group while conducting Net Promoter Scale (NPS) customer satisfaction surveys it has become apparent that individual services score on average significantly higher than those rendered by collective teams. It just goes to prove that great services provided by committed individuals are so much more apparent than collective services delivered by some committed individuals and some not so committed. Which leads to them being compromised in some way, sometimes to their total demise. This leads me to conclude that greatness is far more likely to manifest as a result of a great individual’s heart or soul presenting as courage or truth and preferably both. Therefore intrinsic courage and truth which distill together as strength are far more easily maintained in a committed individual than any more powerful collective, where any one weak individual within its ranks can dilute their entire resolve. Without doubt, fear and lies can bring together powerful collectives but they will always lack strength when it is likely that many of their individual members will be rendered powerless in the face of a strong and committed individual, who has an unbending fortitude and in some cases is even prepared to die for their cause. 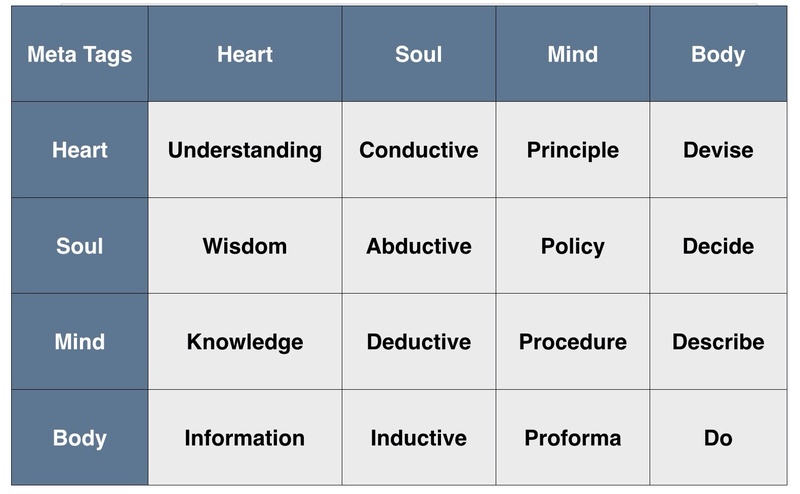 This consideration has led me to devise the ‘Quadrants of Influence’ in the above diagram. As you can see the top right tile is both present and active representing the embodiment of a strong individual who leads based on merit. Presence is my definition for a combination of courage and truth which dispels fear and lies. Present meritocratic individuals use their strength of advocacy to wield power by consensually harnessing the democratic collectives shown in the bottom right tile. Absent bureaucratic collectives and autocratic individuals will always feel their own power bases threatened by this and so they despise and challenge that strength with all their might. The absent active force represented in the top left tile is defined by an autocratic individual who can be powerful and lead by force but their power is so often grounded in fear and lies. Active autocrats will use their force of will to wield this power over the passive bureaucratic collectives shown in the bottom left tile. That is of course until those usually passive bureaucracies have had quite enough and overthrow their pet tyrant, only to replace them with a fresh one. A great example of this whole dynamic would be the showdown between two very meritocratic individuals; Churchill and Roosevelt, who both had the strength to advocate that their respective democratic collectives should rise to meet the threat of the Axis powers. Whereas the Axis powers were largely bureaucratic collectives ruled by poster boy autocratic tyrants, namely, Hitler and Mussolini. This all leads us back to a greater understanding of the Tank Man phenomenon as it too involves all four quadrants of influence. Our anonymous hero was the perfect example of a strong individual meritocrat, facing down a powerful collective bureaucracy that had been ordered by forceful autocratic leaders, to quash a collective democratic uprising. “Those who fail to learn the lessons of history are doomed to repeat them.” – George Santayana. Enough of the history lesson. 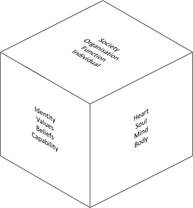 So what if we took the understanding of the ‘Quadrants of Influence’ and sought to understand a present day struggle? The personal data sovereignty movement is a great case in point. It is a mounting necessity in a digital era where there are endless issues surrounding the ubiquitous nature of our data and how it is constantly being misappropriated. This movement already has key collectives forming like Privacy by Design (PbD) and the Respect Network and they are championed by meritocratic individuals who have seeded compelling advocacy in their charters to win over the hearts and minds of the democratic collective. On first reading the PbD – 7 Foundational Principles, I was struck by the uncanny parallels with an older cause championed in conventional industry, that of ‘Safety by Design’. The Privacy by Design (PbD) approach is characterized by proactive rather than reactive measures. It anticipates and prevents privacy-invasive events before they happen. PbD does not wait for privacy risks to materialize, nor does it offer remedies for resolving privacy infractions once they have occurred – it aims to prevent them from occurring. In short, Privacy by Design comes before-the-fact, not after. We can all be certain of one thing – the default rules! Privacy by Design seeks to deliver the maximum degree of privacy by ensuring that personal data are automatically protected in any given IT system or business practice. If an individual does nothing, their privacy still remains intact. No action is required on the part of the individual to protect their privacy – it is built into the system, by default. Likewise, Safety by Design is a concept and movement that encourages construction or product designers to ‘design out’ health and safety risks during design development. The concept supports the view that along with quality, programme and cost; safety is determined during the design stage. At Present Group we service the industry sectors of mining, oil & gas, utilities and infrastructure for some of the worlds largest public companies. We help them to safely and effectively commission and operate their major assets throughout their life cycle. Over the past few decades there has been a great struggle in these sectors to win over the hearts and minds of individuals to embrace the concept of zero harm. Basically the right of every individual who works in industry to return to their families and loved ones unharmed and in one piece no matter how hazardous their work environment happens to be. Just as PbD advocates, one of the greatest challenges has been shifting the focus and culture from a reactive to a proactive approach. A reactive safety culture is easily identified as it will mainly attend to Lag Key Performance Indicators (KPI’s). Unfortunately this places the emphasis on attending to issues after the fact and invariably people continue to be injured or worse as a result. Lead indicators on the other hand are the preserve of proactive cultures who aim to identify and attend to safety issues before someone has to suffer the consequences. At Present Group we often say of some clients, that they do not have to get it in their hearts and minds that this is the right approach, as long as they at least get it in their minds that it is good for their business if they do not harm people with impunity. Privacy then has many parallels to safety. For in the earlier days of industry and still to some extent in emerging economies today, large corporates have continually trampled on individual safety rights in their pursuit of profit. It appears that the very same attitude is occurring with regard to an individual’s right to privacy. Since the proactive approach of ‘Privacy by Design’ is relatively in it’s infancy compared to the movement for ‘Safety by Design’, most of the major tech companies and government surveillance agencies still only pander to reactive cases; usually only changing their behaviour once they have been caught red handed and publicly chastised. Recently the European Court of Justice has made a ruling that could have significant implications for search engine providers such as Google, Microsoft and Yahoo. It has also elevated the phrase “the right to be forgotten” into the public domain for no doubt endless heated debate. Although the arc of this debate will probably trend from the black and white quest for “the right to be forgotten” to a more realistic and achievable; “right not to be found easily.” Still it is certainly a healthy move in the right direction. 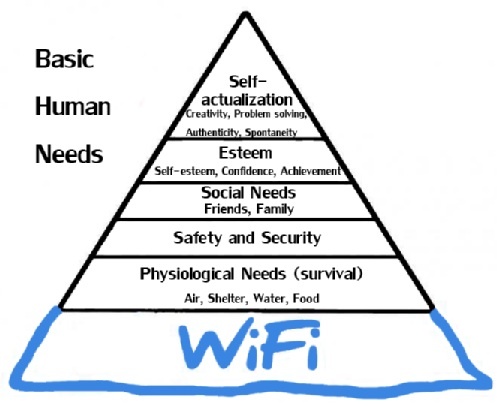 As you can see our basic needs for safety and security (privacy) are somewhere down the bottom of the pyramid. Much in the same way that the majority on our planet who were not fortunate enough to be born into the first world are constantly preoccupied with the daily struggle to secure their lives and families with food and shelter, today’s digital economy appears to be denying the vast majority of first world users and browsers the basic right to secure their privacy. Quite simply, those further up the hierarchy who have met both their physical and privacy security needs, as they can well afford to, just do not see the importance for those still struggling to achieve it. Especially when it may also impact on their business or investment interests ability to profit by it and stay up there on the higher reaches of the pyramid seeking self esteem for themselves. Call it the cost of progress if you like but it is imperative that a more evolved proactive approach as outlined by PbD helps us all to catch up. This temptation for those who have taken care of their own basic security needs to continue to exploit those who are still struggling to do so has always been there. Especially when it means that they can profit further and satisfy the higher level aspects of the hierarchy of needs albeit at other less fortunate peoples expense. Today the new fortunes are to be made in the digital arena so it is little wonder that it is personal privacy rights that are being ignored, just as the early industrialists did with regular impunity in regard to personal safety rights. The above meme is true to the extent that the desire for personal space may have always led to antisocial behaviour but with one vital missing element; The key difference is that unlike today’s online experience, no one knew in the public domain what you read, or what you thought about what you read in the newspapers, unless that is, you chose to break your own anonymity and wrote to the editor. Well, when it comes to the digital hierarchy of needs, the current boys club of tech billionaires will do nicely in the role of self serving Princes. While the NSA and other government agencies are obvious candidates to be branded as intrusive government bureaucracies. Without casting too big a shadow on these two influences, it all comes down to a simple matter of maturity. You see, archetypal Princes unlike archetypal Kings and Queens don’t tend to serve the people. Without a true Monarch’s sovereign burden of serious matters of state, that serve, to serve the greater good, Princes are free to be frivolous and selfish play boys if they so choose. In a recent interview Bill Gates demonstrated that he himself has dramatically made the shift from tech Prince to King consciousness, replacing his own self interest with that of the greater good. Technology is “amazing,” Bill told the Financial Times, but it’s not going to save the world. The Microsoft co-founder said that though improvements in technology may have their benefits, they won’t meet the needs of the world’s most desperate. “I certainly love the IT thing,” Gates said. “But when we want to improve lives, you’ve got to deal with more basic things like child survival, child nutrition. PCs are not, in the hierarchy of human needs, in the first five rungs,” he later added. Gates’ comments come just a few months after Facebook co-founder Mark Zuckerberg and a group of other more recent ‘Tech Princes’ had tried to position Internet connectivity as a primary humanitarian concern, promising to bring Internet access to the entire world. It would be very much like a stereotypical Prince to confuse self interest with philanthropy in order to feel better about themselves. While, great leaders, like great Kings and Queens always eat last. So when asked by the Financial Times whether Internet connectivity is more important than, say, finding a vaccination for malaria, the mature Gates responded: “As a priority? It’s a joke! If you think connectivity is the key thing, that’s great. I don’t,” he added. This myopia of youth has also lured the two well meaning founders of Google to naively claim that they would ‘do no evil!’ Before the full understanding of how their mission statement; ‘to organize the world’s information and make it universally accessible and useful’ would come into direct conflict with their own self interest and that of the people. And so in the interests of seeking to understand all, in order to forgive all; It is probably fair to view the current array of ‘Tech Princes’ as immature and misguided ‘Sorcerers Apprentices’ as imagined by Goethe, who have tried to seize power too soon and wield it before they themselves fully understood the serious implications and consequences to an entire world. Apprentice Prince Mickey confronting his own consequences. And when it comes to passive governmental collectives, your average bureaucracy is just not as mature as your average democratic collective. Ruling by fixed rules as bureaucracies tend to, invariably leads to many a hypocritical reaction which have been used to justify amongst others things, the NSA’s breach of public trust. Whereas ruling by consent as democracies do, can on the whole deliver a more proactive majority endorsed solution. Just as we have struggled for the irrefutable right to a safe work environment in order to protect our physical selves while making an honest living; We must also challenge the tech corporates and government bureaucracies to put aside their respective profit and political imperatives until such assurances are given for our sovereign right to privacy. This realisation is now setting the stage for a great and just struggle of epic proportions. The autocratic Princes and their bureaucratic machines pitted against a handful of committed meritocrats speaking for the hearts and minds of the passive democratic collective to take it back! Rachel Botsman http://www.rachelbotsman.com/ captures this well by describing the three camps which are either engaged or disengaged from disruption. In terms of the ‘Quadrants of Influence’, Rachel’s ostriches could also be said to resemble the passive bureaucratic and democratic collectives. Her ‘Fighters’ description is also text book for how the tech and industry Princes act out if threatened. They made it to the top with their own disruptive practices and so intend it to stay that way by either acquiring new disruptive entrants or using Machiavellian political, economic or legal power to bar the way of any new entrant. Lastly, there are her ‘Pioneers’ who start out as strong and disruptive meritocrats but don’t always stay that way when they get on top. Like all pioneers some don’t make the cut, succumbing under the onslaught of arrows to their backs. So stopping others ascent is a clear example of Rachel’s ‘Fighter’ mentality when it would endanger their economic power base. Although the term disruption which is in common usage for new technological advances is not so often used for social disruption, the principal is basically the same. Last century it was social emancipation, such as the struggle against racial and gender inequality that disrupted the status quo of political and economic power. This century it will be a struggle for technical emancipation that will guarantee the freedom to live our lives as sovereign beings. And so the same powerful and privileged minorities will use all of the political power at their disposal to maintain their economic base when challenged by a cause such as the right to ‘Personal Data Sovereignty’, maybe even more so as it will combine aspects of both social and technological disruption. The current boys club of autocratic ‘Tech Princes’ who have built their fortunes mining our personal data have no interest in honouring our irrefutable right to be forgotten if they can help it. Therefore, we will need to struggle to remind those higher up the digital hierarchy of needs that we have a right to be forgotten, just as we called on the powers that be in industry for the right to remember our personal safety concerns. If as it appears, the personal data sovereignty movement is one of the people, for the people then there is no room for immature Princes serving their own self interest. For this movement can only manifest in a grown up internet where values come first and respect and honour aren’t just reserved for tokenistic mission statements. One clear way to distinguish who? might be who? in the zoo so to speak would be to look out for Level 5 versus Level 4 traits in the emerging movement’s leadership. Jim Collins of ‘Good to Great’ fame neatly summarised the two approaches. 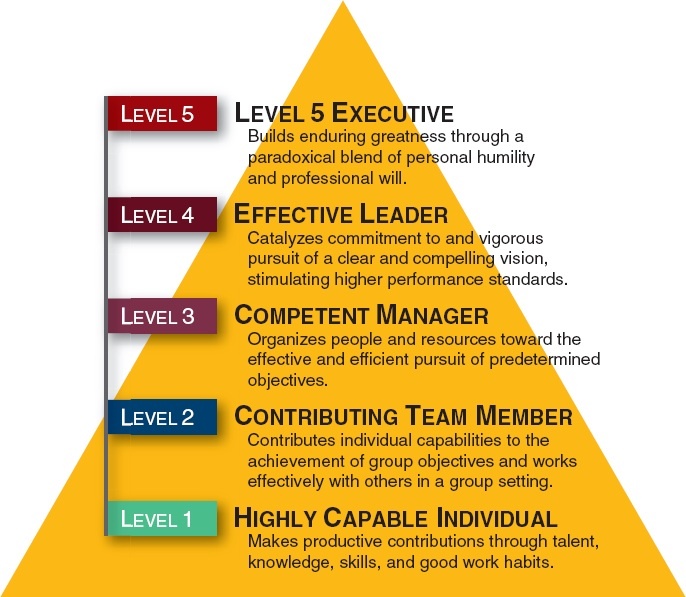 Level 5 leaders are ambitious first and foremost for the cause, the organization, the work, not themselves and they have an iron will to do whatever it takes to make good on that ambition. Level 4 are ambitious for themselves. Level 5 leaders practice the window and the mirror. They point out the window to people and factors other than themselves to give credit for success. When confronted with failures, they look in the mirror and say, “I am responsible.” Level 4 leaders do the reverse, they use the mirror to credit themselves with success and the window to find someone else to accredit blame for failure. Level 5 leaders might be charismatic, but this is not the primary source of their effectiveness. They inspire others primarily via inspired standards for excellence, hard work, sacrifice, and integrity not with an inspiring public persona as many a Level 4 leader does. – Level 5 Leaders are without doubt strong! then powerful! – Level 4 Leaders are without doubt powerful! Therefore, Level 5 should be the sole preserve of our greatest Kings and Queens who understand and honour sovereign rights, be they individual or collective. Princes can achieve Level 4 but they will never unite and govern the people effectively for many generations to come. Thankfully the Personal Data Sovereignty movement has many level 5 candidates and soon we shall all find out who has the courage to carry our age and the truth to lead us all in the right direction. Only then will we have a mature and safe environment with which to navigate and transact our lives. The Respect Network global launch begins on June 23 2014. First of all I must thank Dan Blum of Respect Network http://security-architect.blogspot.com & Katryna Dow of Meeco http://katrynadow.me for suggesting the original premise for this piece. Basically, what if Plato, the founding Father of Western Philosophy, was kicking around today. Plato was undoubtedly a giant in the wisdom stakes and like Lao Tzu before him it is so easy to be in awe of such a compelling character as he appeared to understand everything that was important about life before anyone else got out of bed. He even knew he had the sciences trumped before most of them had even emerged. So what if Plato had a second coming and presented today as an untypical, typical 21st Century Gen Y hipster with a burning desire to blog his paradigm shifting philosophy without fear of being shutdown. Well, in this era he would be far more likely to emerge as the Founder and CEO of an Onexus Republic rather than form his Academy amidst a grove of olive trees outside the city walls. As an aside on the brand Onexus http://www.onexus.com In the late 1990’s I had a flash of inspiration when describing what I thought the first wave of dot-coms could do in terms of disruption. For a start they could be one nexus, eliminating all middlemen and allowing the meeting of one with us. One day the two separate words of ‘One’ and ‘Nexus’ happened to combine in my minds eye as I spoke them out loud and Onexus or one multiplied by us was born. I was so ecstatic that I now had my quintessential dot-com brand that I lay on the office floor making carpet angels and letting the euphoria wash over me. I’m a little more reserved these days but only a little as those that know me will testify. Anyway, rolling forward over a decade and I have dusted off the brand again to embrace the Personal Sovereignty movement and MeCommerce in particular and I am also pleased to see that the rate of disruption is increasing as promised. Disruption is nothing new, only these days because of technology it affects more of us much faster than ever before. This acceleration is no doubt due to the fact that our technology has reached a level where we have tools, mainly computational ones, to shape newer more complex ones, and so the half lives get halved again and again. All this innovation started somewhere and some 3000 years before Plato, the advent of the wheel no doubt disrupted those who carried things on their backs for a living. So today Plato would be spoilt for choice to disseminate his ‘School of Thought’ through any number of technology delivery systems. Once his reputation was established he could even consider co-creating with a MOOC (Massive Open Online Course). One of the fastest means however would be for him to simply register his own personal cloud name with a CSP like Onexus as part of the Respect Network http://www.respectnetwork.com the world’s first Personal Cloud Network. He could then blog to his hearts content building his thought leadership within a peer to peer sharing network of like minded souls without fear of intrusion by the ever present powers that be? As you can see a Personal Cloud can be reduced to a bucket with your name on it. For added security you can always add a lid. That concludes the tech part of this blog, now back to the philosophy. 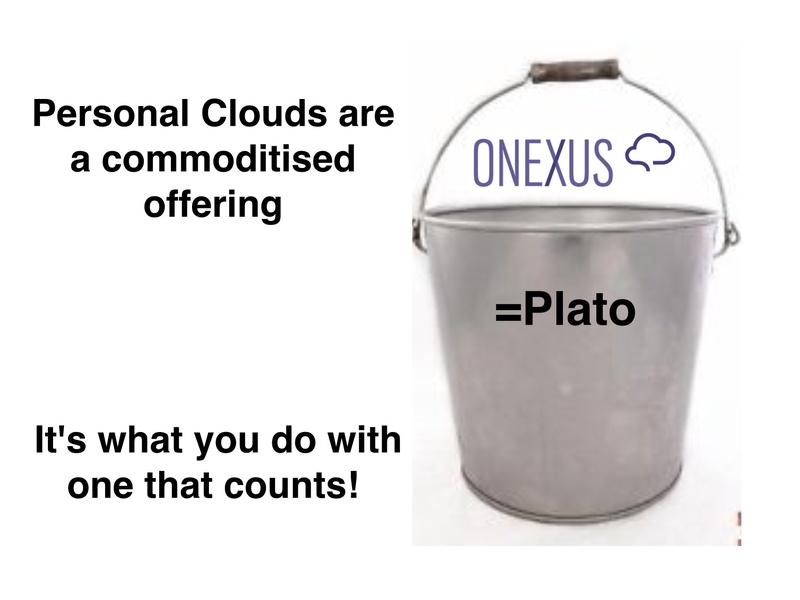 In reality of course a Onexus / Respect Network Personal Cloud is so much more than a bucket. It guarantees the option to be anonymous, the ability to sign-in, sign-on, communicate, exchange and be part of a decentralised peer-to-peer network where a Plato could continue to exchange his ideas freely and directly. Unlike current Social Networks he would not have to risk his ideas being indexed or data-mined or used for advertising or be removed totally from society so he was denied a voice. The Personal Cloud itself is a commodity which can be carried around like a bucket. It’s most important feature as far as Plato would be concerned is that it is undeniably yours to decide what to carry and what to share. A Personal Sovereign Kingdom. Overall then, when it comes to democracy we don’t vote them in so much as we tend to vote them out. It’s not proactive or generative, it’s instinctive and reactive at best. And so we let the self serving polarities rule us in turn, largely through our own default apathetic resignation. We are lucky if we get mediocrity for a term or two and a Plato ideal such as a Meritocracy ruled by Philosopher Kings and Queens is as illusive today as it was in his day. Democracy does have certain advantages though, when it comes to keeping other less desirably forms of government in check. Plato saw this first hand himself when in his youth he witnessed the rise of the ‘Thirty Tyrants’. An oligarchy which by comparison made the previous democracy in Athens resemble a golden age. And now coming up for three thousand years later our personal data is largely ruled by a small group of corporate oligarchs supposedly providing us services for free while they in turn are hacked by their own democratic government. Even Plato would acknowledge that this mess is still progress of sorts when you consider that the ‘Thirty Tyrants’ in his day, also eradicated five percent of Athenians during their short reign of terror. 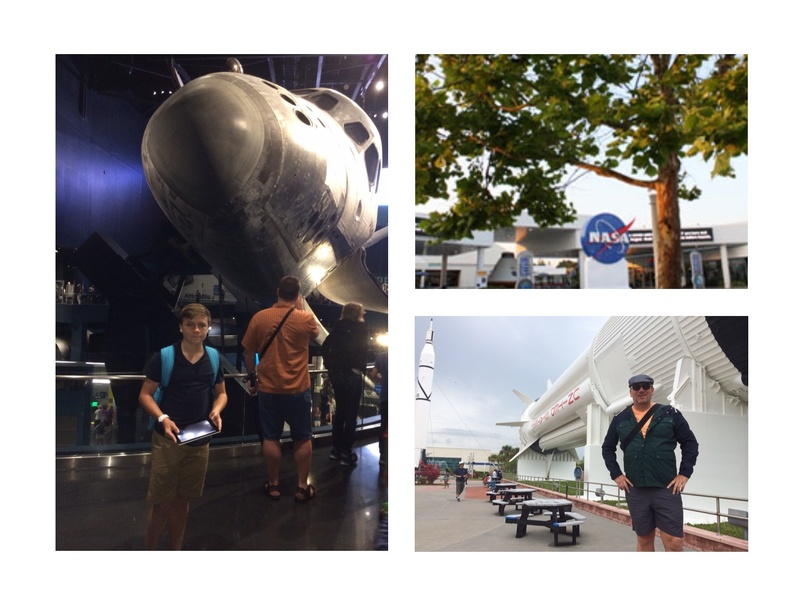 My own most recent insight into the pros and cons of democracy came on a much anticipated visit to NASA’s Kennedy Space Center at Cape Canaveral this April. The previous day my son Ross had checked off his holiday bucket list when we experienced the Harry Potter ride at Universal Studios after suffering over two hours in a queue. Now it was my turn as Kennedy was firmly on my boyhood bucket list when it had been the launch pad for the massive Mercury, Apollo and the Shuttle Programs. There was also the added bonus that a launch scheduled for earlier in the week had been postponed to go ahead on the day of our visit! Sadly the days of the big scale NASA programs are over and the one we witnessed that day, the Falcon 9, while still quite spectacular is financed by SpaceX, a private Company. The Falcon 9 Rocket is the brainchild of their Founder Elon Musk who made his first fortune in the dot-com days with PayPal before investing in the more tangible engineering fields of space rockets and Tesla electric cars. Anyway, while I pondered this odd state of affairs and the shift from public to private Space activity, the Falcon fired it’s 9 Merlin Engines. Ross and I stood in the shadow of a Sycamore “Moon Tree.” The tree’s plaque described how the original seed had been to the Moon with the Apollo 14 Mission. It had now grown to maturity and as Ross watched the rocket journey out of site, I saw a relatively straight branch that had fallen at our feet which I quickly stripped down and fashioned into a wand. Now to me this was real Magic! Not the manufactured magic of Hogwart’s from the day before when we had purchased the obligatory official merchandise including replica wands. Ross lit up too when I explained the significance. The DNA code in this new wand had been to the Moon and back. He was holding in his hand something material born from 4.5 billion years of geosphere evolving into biosphere, that had then journeyed to another world and back again. This one data point made a common or garden tree branch wand priceless as far as Ross was concerned. 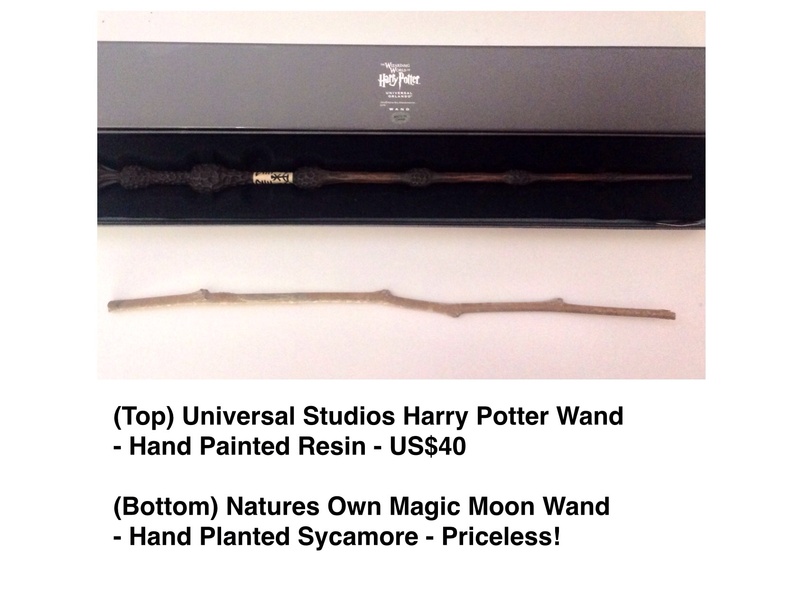 While an official Harry Potter resin wand made in China will only set you back $40 US including tax. Apparently ‘Moon Trees’ have been planted in cities around the world. Just don’t tell my Son that the Cape Canaveral Sycamore is not the only one. I don’t want to dilute the magic. Now please stay with me because it struck me like never before how a single data point on a material object could change everything in terms of how we placed value on it. Even when the object was intrinsically exactly the same as before. I also then remembered an article I had read a few years back about Neil Armstrong, the first man on the moon, a vital data point that had destined him to become the most famous Astronaut to ever launch from the Cape. The article had described how Neil had become involved in an unusual legal battle with his barber of 20 years. After cutting Armstrong’s hair, the barber had sold some of it to a collector for $3,000 without Armstrong’s knowledge or permission. Neil threatened legal action unless the barber returned the hair or donated the proceeds to a charity of Neil’s choosing. The barber was unable to get the hair back, but decided to donate the proceeds to the charity of Neil’s choice anyway. If you have read Neil Armstrong’s bio then apart from his amazing feats as an Astronaut and Test Pilot, you will know that he was an incredibly private and humble man and sadly he passed away a couple of years ago in 2012. In this crazy and unjust world that over values exclusivity this would no doubt have made the stolen sample of his hair worth even more? So this got me thinking; why is it that when something leaves your body such as hair which is not special other than the fact it contains our unique biological data in the form of DNA that it is held in so much higher regard than digital data which is also uniquely ours and in most cases these days will have a far greater impact on our lives when it leaves our control? Neil’s biological data was attributed extra value because of his historic achievements but this is not the case for the rest of us mere mortals. In short, a meme is not worth a gene! Or at least this is the case for now? I was still considering this bias in favour of value placed on our personal biological data versus the value we place on our personal digital data when I boarded the flight home. Our technology is no doubt moving so fast that our emotional connection has not caught up with the fact that discarded or stolen digital data is far more likely to come back and bite us than our misappropriated biological data? Niki looks back in anger before walking away to his fate in the ensuing inferno. If ever there was an example of Katryna Dow’s vital insight that one of the four key aspects with which to value personal data is it’s time bound nature. In this case the fan would have in his possession proof of Niki’s last ever signature which would no doubt make it more valuable than all the rest he would have given out in his career which lacked that one vital data point. So now let us come back to how a modern day Plato might perceive things in our digital democratic era? For one he would witness that the same form of democracy that captured our hearts, minds and imagination with the NASA Apollo Moon Shot program, is now capturing our personal data with their NSA surveillance programs, like PRISM. Both of these democratic government agencies required billions of dollars and tens of thousands of their citizens to achieve their ambitious aims. One filled us with inspirational awe and advanced our everyday technology in so many ways and while it may be argued that the other may still advance our surveillance technology? This will be unlikely to serve us the people, instead the whole sordid realisation just brings our contempt and quite rightfully so. So what has changed in the 40 years from NASA’s glory days to the recent NSA revelations, apart from the coincidental dropping of a letter from a government agency acronym? The short answer is nothing has changed in terms of a democratic government’s desire to spy on it’s own people. After all, we had the Watergate debacle in the same era as Apollo, it’s just that our governments now have the technical ability to sanction wholesale industrial scale eavesdropping on our lives these days and so they do. So the original Plato and a modern day equivalent would see that not a lot has changed in terms of wielding power for the self serving objective of remaining in control of our shared resources. And until the aspiration for power is used to serve some other notion, it will continue to shape our politics much in the same way as when the Greeks of Plato’s day used fire signals to communicate. 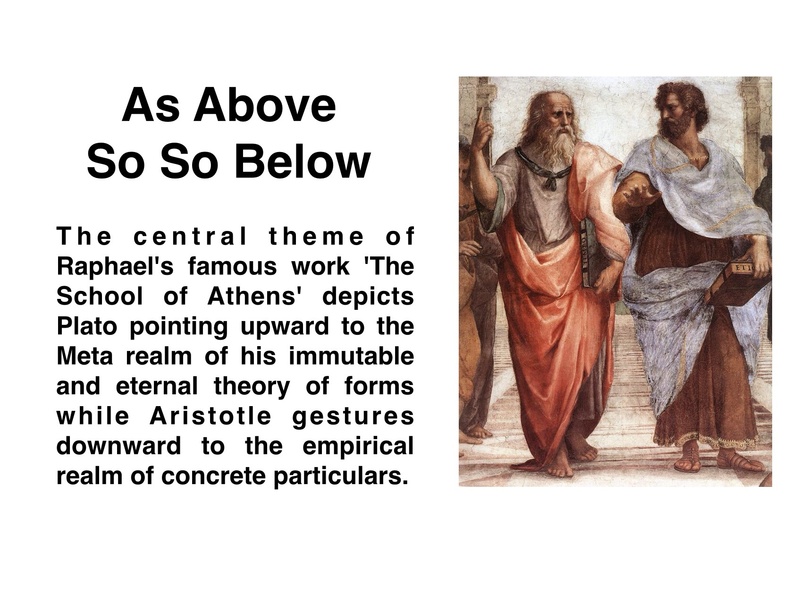 Equally, all of our technological advances throughout the intervening millennia would ensure that a modern day Plato would find it even more essential to gesture upward to the immutable and eternal forms of truth, symmetry and beauty to counter a contemporary Aristotle pointing down to an empirical understanding of big data. Since the fundamental political landscape has not shifted it would be to the technological advances that a modern Plato would look to caution against excess. I for one have noticed that all the new technologies I have encountered in life very soon demonstrate that their greatest asset so often becomes the source of their greatest liability. 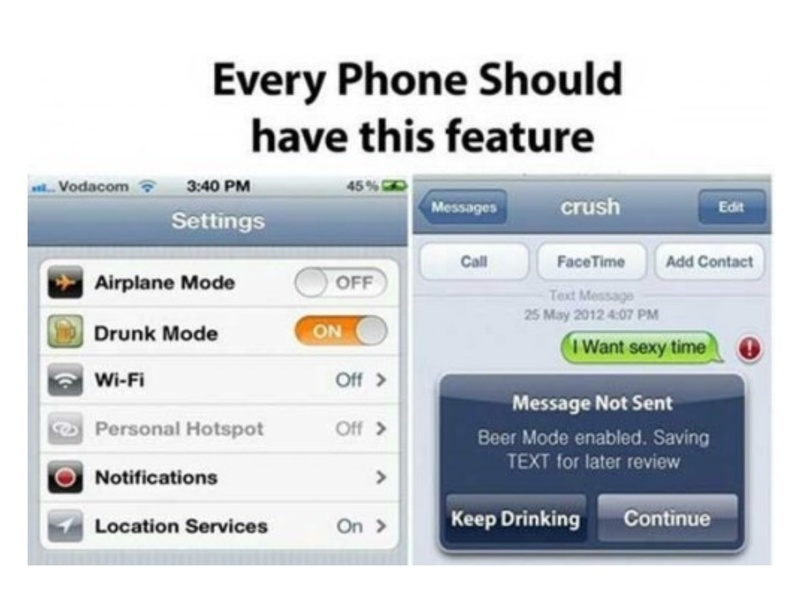 Instant messaging’s greatest asset is it’s ease of use and not surprisingly it’s greatest liability is it’s ease of use. However on the asset side of technology’s ledger, a modern day Plato could instantly become his own Philosopher King. Albeit in a Kingdom of one on one with other Kingdoms of one. With the personal sovereignty of his own cloud in a peer to peer network our reincarnated Plato would soon see that there in would lay the critical liability. Quite simply, the ease of entry into this type of Kingdom makes opinions or personal philosophy, ubiquitous. Again on the asset side of the ledger at least the powers that be could not shut down a personal cloud the way they eventually shutdown the original Academy founded by Plato in Ancient Greece. But then, back in the ancient day there were so few scholars that they kept most of the good stuff hence Plato’s work was passed down. Whereas these days, there are so many pundits and opinions and storage is so easy that we keep absolutely everything and so finding the great above all the noise and nonsense, is the real issue. I have no doubt that there are countless genius bloggers out there. Plato’s idea of Philosopher Kings and Queens who won’t be recognised in their own lifetime, if at all. Hidden in ubiquity or ahead of their time, which will make them wrong in their own time, they will go unheeded. So the truth is that Plato’s vision for the rise of Philosopher Kings and Queens is more realisable than ever. Unfortunately the same technology that has empowered a peer to peer world where the great influence of wisdom can be disseminated to help humanity find it’s way is also the reason it is for the most part being drowned out. One way to counteract this of course is the notion of up-votes. Unfortunately, as Plato would very quickly point out, up-voting and ‘Likes’ is still a democratic process that may or may not take merit into account. As an example, the only social network that I am still on is Quora http://www.quora.com ‘Your Best Source of Knowledge’. 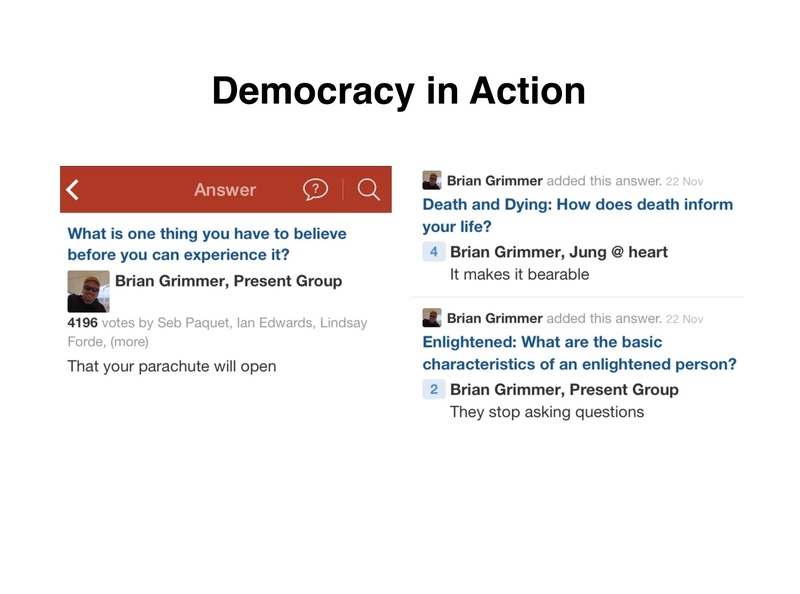 Quora is a community of Q&A fanatics who ask and answer, seeking and dispensing the sort of exclusive knowledge that a Google search will not satisfy. Others like myself often amuse ourselves with harmless trolls of unanswered questions. As you can see on the left, my flippant answer regarding the parachute got an enormous rate of up-votes because everyone gets it and finds that it hit the spot. While some other more deeply considered philosophical understandings on the right, go largely ignored. As in Plato’s day, it appears good still remains the enemy of great! The Plato’s of today who are ahead of their time may well remain so? Only to unlock the secrets of today’s unsustainable state of affairs with enlightened solutions for the generations to come. 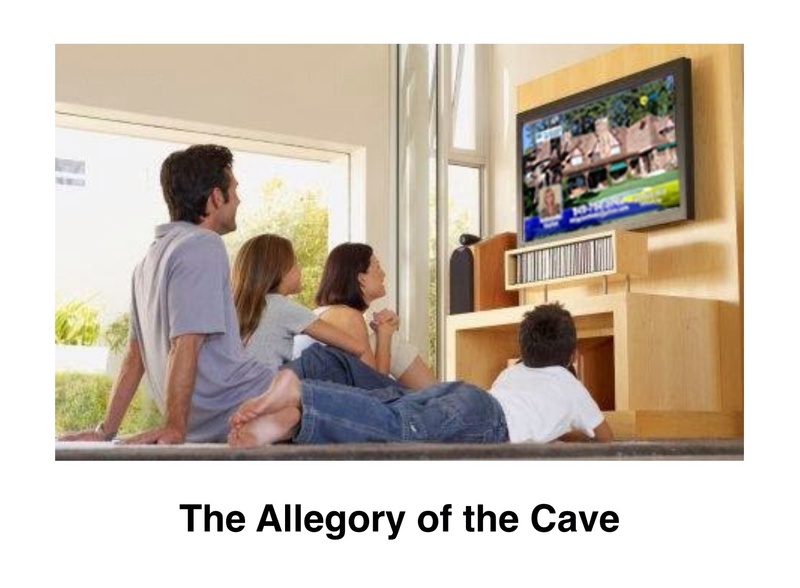 So this brings us full circle to Plato’s great Allegory of the Cave. And as Dan Blum pointed out in a recent blog, at the end of the allegory the freed one is returned there to dwell with the prisoners, sharing in their labors and honors. Maybe enough of us who have been set free by this latest awareness around privacy can encourage the others to turn their heads and see for the first time the real objects that deny us privacy. Only when others come to grasp the true forms that Plato espoused will they see the real causes of their distracting shadows and they will realise their error. Our Faith in the Fourth Future : Or Why All Journeys Begin & End in the Heart? At Present Group we have been engaged in a struggle. Like so many before us it is the constant struggle that can be summed up as the creative tension between pragmatism and vision. Our vision is to create a culture which is a ‘Social Venture’ first and a business second. It was Churchill’s canny observation that “the inherent vice of capitalism is the unequal sharing of blessings while the inherent virtue of socialism is the equal sharing of miseries.” Sadly this still rings true and is largely responsible for our current global dystopia and manufactured scarcity. Conventional business practice would invariably put the economic facet and an impersonal single bottom line focus above all others. While the political and technical would also serve the economic imperative and not the social. In hardened business cultures, social systems form, if at all at a grassroots level independent of the business and its objectives. To be a social venture first and a business second means turning this hierarchy on its head. Yet as a vision this is all very well until the pragmatism of meeting bank covenants and reversals of fortune in the market intrude and test our resolve as the economic facet demands primacy…..hence the ongoing struggle. In order to remain steadfast and never sell out when this occurs we have to delve deep into our hearts. After all a social venture is a sovereign concept much like a family, community or nation and we would never consider selling them out as we hope that they will continue on, to flourish and prosper generation upon generation. Up until now most businesses see things somewhat differently; they constantly sell out, float, merge and shutdown all the time. Again Churchill offers another vital insight when we way up the pros and cons of selling out when confronted with economic dire straits. Early in the War and in his new role as Prime Minister when all seemed lost he was severely challenged by Lord Halifax and others in his cabinet to negotiate a peace settlement. As an avid student of history Churchill gave an inspired speech “that nations which went down fighting rose again, but those that surrendered tamely were finished” he concluded his impassioned speech, saying “If this long island story of ours is to end at last, let it end only when each one of us lies choking in his own blood upon the ground.” Now that is heart! I too have been both blessed and cursed with irrefutable faith in the concept of intrinsic sovereignty. This has become deeply embedded at Present Group and if all else failed we would prefer to go bankrupt rather than sell out. This arises from a core belief that as custodians we would rise again unified in heart, soul, mind and body, such is the passion for our purpose. I can only conclude that they do. The Meta Model for Process has revealed to us that evolution is a quaternity much in the same way that information, knowledge and wisdom beget understanding. 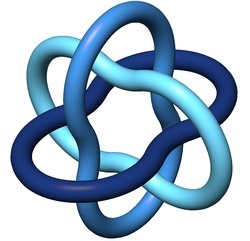 When considering ovolution; think egg, seed, DNA or code which may be hinted at in Stephen Wolfram’s prediction that there is an algorithmic key to the Universe that can compute quantum physics – or, say, reality TV – in four lines of code. While involution may be likened to the accumulated material descent; from unknown to known or as the great Arthur M. Young put it; from freedom to determinism. Often when describing involution (accumulation of material complexity) Arthur used the example of photon to particle to atom to molecule, suggesting that from a material sense nothing is as free as light and nothing is more determined than molecular structure. Chardin imagined the noosphere as “…. An ultimate envelope taking on its own individuality and gradually detaching itself like a luminous aura. This envelope was not only conscious, but thinking…the very soul of the earth.” Interesting to note that he uses the term ‘soul of the earth” as this equates to the third stage of the meta model’s envolution….co-creation (soul). The Omega Point is the purported maximum level of complexity and consciousness towards which some believe the universe is evolving. In the original theory of Vernadsky, the noosphere is the third in a succession of phases of development of the earth, after the geosphere (inanimate matter) and the biosphere (organic life). Just as the emergence of life fundamentally transformed the geosphere, the emergence of human cognition has fundamentally transformed the biosphere. For Teilhard, the noosphere emerges through and is constituted by the interaction of human minds. The noosphere has grown in step with the organization of the human mass in relation to itself as it populates the earth. As mankind organises itself into more complex social networks, the higher the noosphere will grow in awareness. Teilhard argued that the noosphere is growing towards an even greater integration and unification, culminating in unity, which he saw as the ultimate goal of history. Teilhard was holistic as opposed to esoteric, scholastic or pragmatic and so referred to this unification as Christ consciousness but for the non-religious amongst us this can be understood as the full presence of heart manifesting as unconditional love. It appears that Rumi the 13th Century Persian philosopher poet also understood envolution in holistic terms. Here he beautifully describes envolution’s accumulation of functional complexity and re-ascent from determinism to freedom. 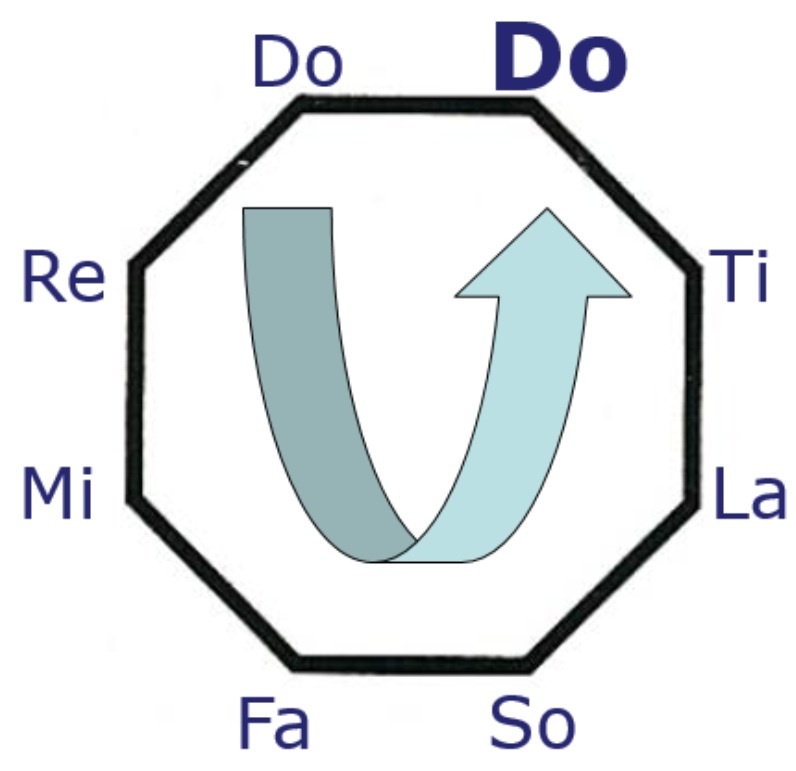 If we are to try and understand how the Uni-Verse (one song) sings, in all its reflexive glory then we need look no further than the octave as a spiralling octagon. 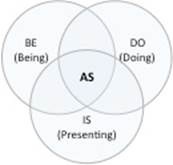 The second ‘Do’ demonstrates T.S. Eliot’s great insight. We know it for the first time because we have evolved to a greater vantage point. A higher vibration. A higher ….octave! 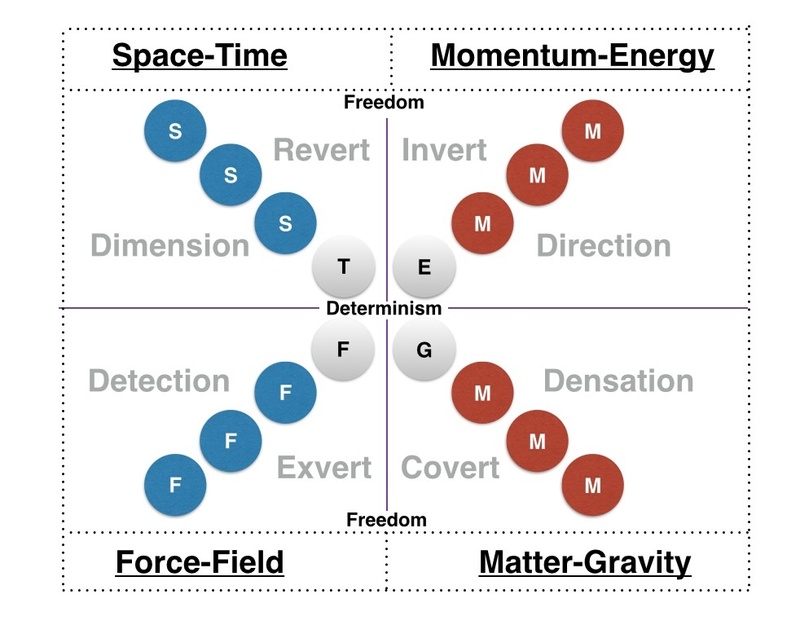 More recently the work of Dr John Smart on STEM Compression (space, time, energy and matter) draws parallels with the ascending process of envolution. 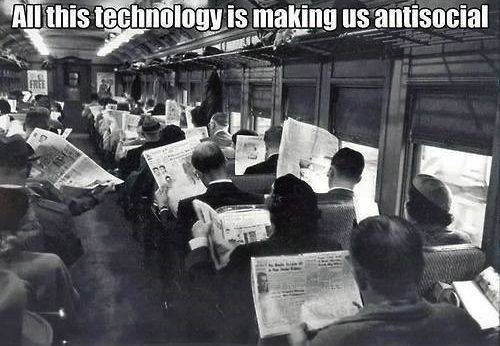 For example STEM compression can be neatly summed up with the advent of the iPad. After all it inhabits less space than a laptop, takes less time to boot up, requires less energy to run and is comprised of less matter. Interestingly we appear to sit conveniently between the macrocosm (universe-level) and the microcosm (sub-sub-atomic or even metaphysical-level) as the universe and its processes continue to fractally unfold. Therefore STEM compression or optimisation may lead us to surmise that our future may well lie in the microcosm. This assumption arises when you consider that just as involution descends by creating more material complexity; envolution dispenses with material as it ascends in functional complexity. 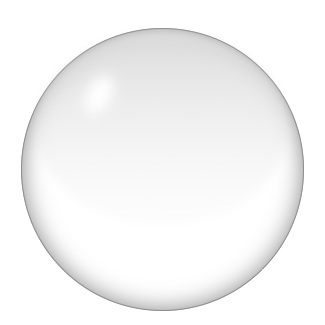 For example the biosphere uses a fraction of the material available within the geosphere. 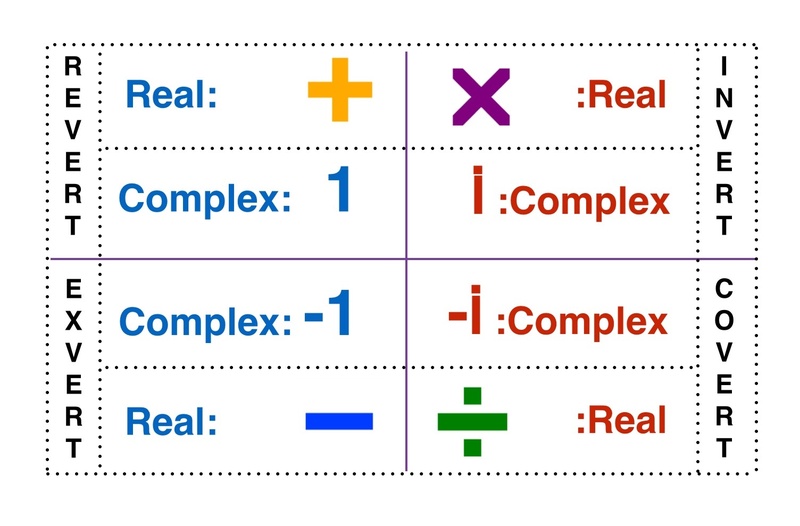 Hence the entire noosphere may well use a fraction of the material available within the biosphere to achieve our next leap in functional complexity. 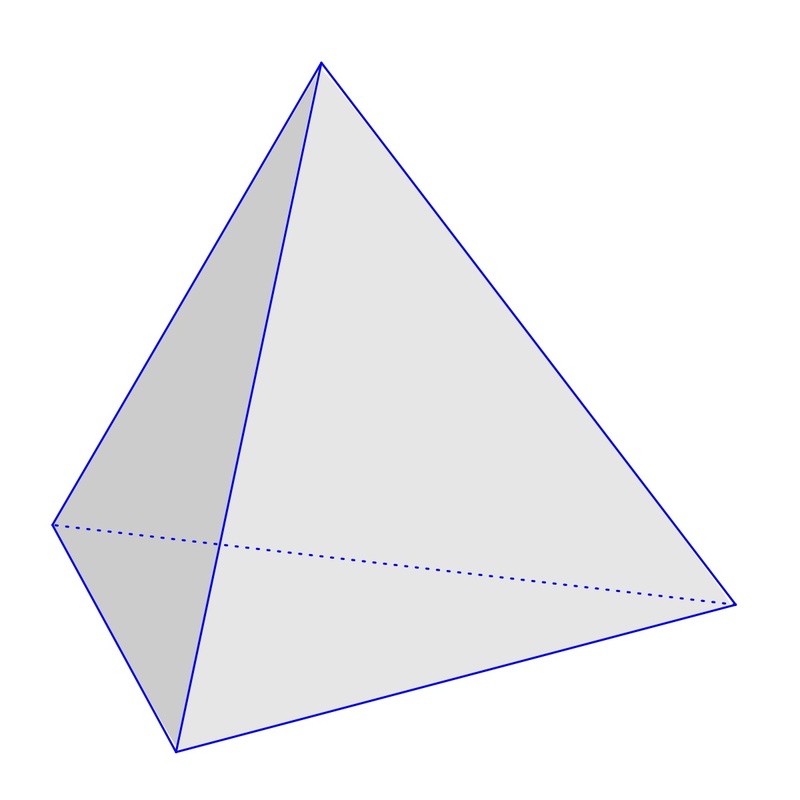 Imagine if consciousness at this level may equate to a near eternity compared to a time bound day as current four dimensional reality becomes higher dimensional actuality. Therefore the Meta Model For Process describes process in terms of progression, not time. Also between every stage of involution and envolution there exists a transformational challenge or crisis depending on your point of view. It appears that to transform toward a complete noosphere of pure consciousness not only will we have to leave our biological containers behind but our current population and technological explosion may indicate that we are not IN a crisis after all, but that we ARE the predetermined and essential crisis within a macro process as we journey toward a fully formed noosphere and ultimately the omega point? 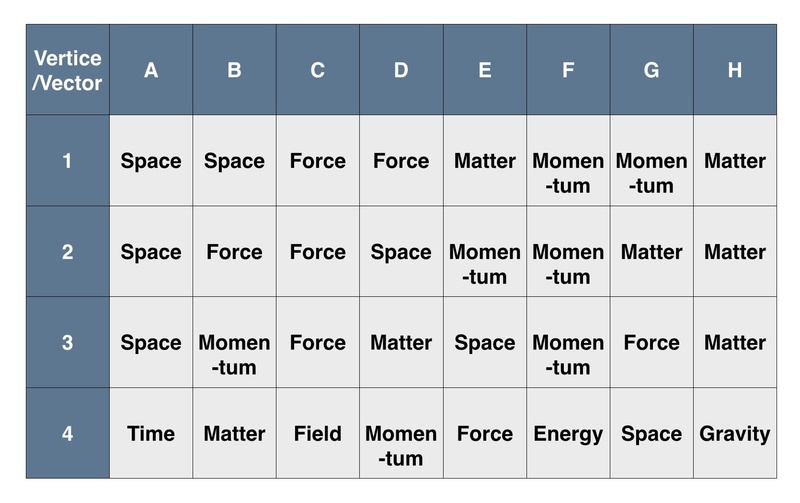 Achieving in meta process terms a full octave above the Big Bang’s heart at singularity? 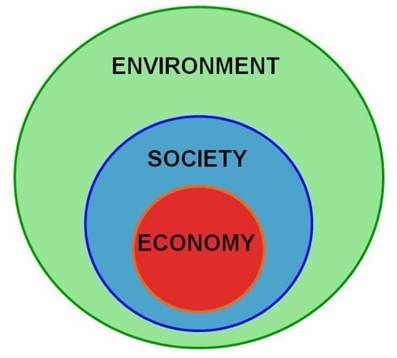 The meta model itself describes the challenge or crisis between biosphere (re-generation) and noosphere (co-creation) as being one of ‘mobility’. Not surprisingly the prospect of leaving our biological containers behind to envolve to the greater freedom of combined consciousness at noosphere and unity consciousness at the omega point is without doubt daunting but it is already underway as we use our technology to hasten the process. As Marshall McLuhan said; “We become what we behold. We shape our tools and then our tools shape us.” Although somehow I don’t believe he intended to extend the concept all the way to an out of body experience. Experience has taught us that the Meta Model For Process does appear to induce altitude sickness in most. Of course it is a big ask within our infinitely fractal universe to comprehend that in both physical and metaphysical terms we can predict progression in any process at any level of abstraction. To trust that at a meta level the universe is reflexing back to a new form of singularity (omega) just as the musical octave reverts to ‘Do’ is less painful once we realise that it is returning purposefully to its heart….albeit a higher heart. While to trust that at a macro level we as an entire system of conscious life-forms are at the leading edge of this meta truth and returning to our own heart or unified consciousness as Teilhard suggests. Admittedly this base pair of generic meta & macro futures although progressing toward the heart may hold cold comfort for some? So what of the futures we might anticipate in our own lifetime? The lower base pair of mesa and micro are specific and hence more accessible as we will have direct experience of this level of process and so can trust the progression from first-hand experience. Just as we all tend to trust processes that we ourselves set in motion but we find it harder to accept that there is an abductive pattern based rule to the greater processes that act upon us. Product innovations are always far easier to convey as the tools that will shape us. 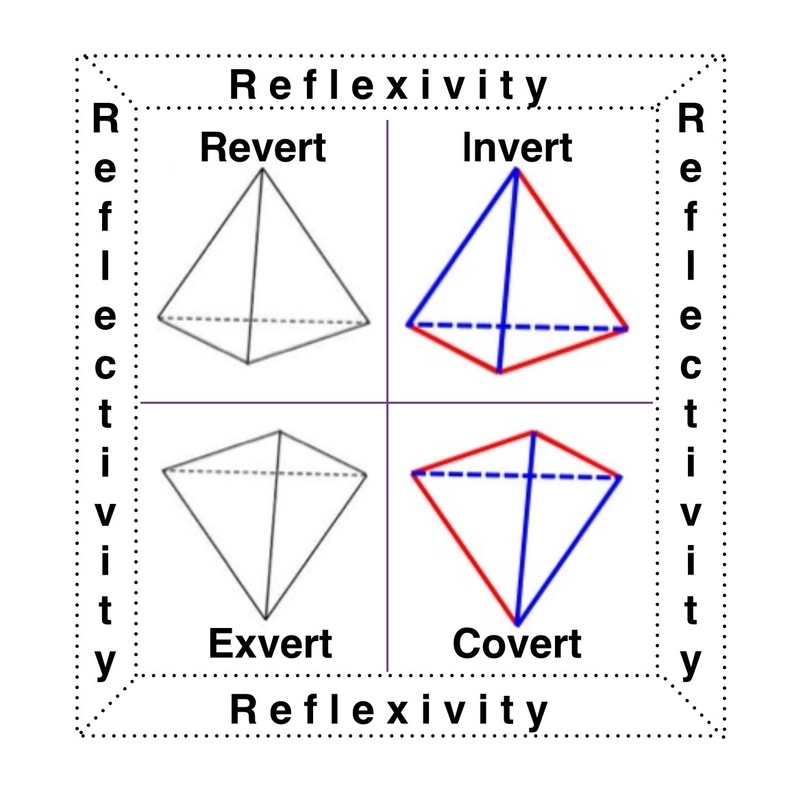 However process innovations as tools are no less important but they do suffer a distinct disadvantage because abductive reasoning is in the shortest supply as it comes more naturally to intuitives, who are in the minority. In my first post in this series I had posited the more immediate process concerning the envolution of the internet, and it’s shifting paradigms from send to search to social to sovereignty and it is to that which I return as it is close to my heart. The personal sovereignty movement is a mesa level process and when you consider the four types of imagined futures below it is gratifying that the preferred is of our hearts. Another meaningful correlation linked to my first post on the ‘Fourth Order Effect’ demonstrates the type of reasoning that leads to these futures. On this basis the fourth future is realised with conductive reasoning which is heart based. Equally encouraging are my own values born of conductive reasoning. For my own journey of the heart is a micro process to honour my own personal sovereignty by never selling out a vision for a unified meritocratic social venture. At all levels it appears that indeed all journeys both begin and end at the heart but for us personally we have to deliberately prefer the preferred futures based on our heartfelt values. To help encourage each other to have the COurAge to ‘carry our age’ and continue our individual journeys toward a unified future, We must have faith that the universe is not selling us out after all…..merely selling us up. This article was written by Brian Grimmer CEO of Present Group with insights and understandings derived from extensive cooperation with Peter Midgley CXO of Present Group on the Meta Model for Process. 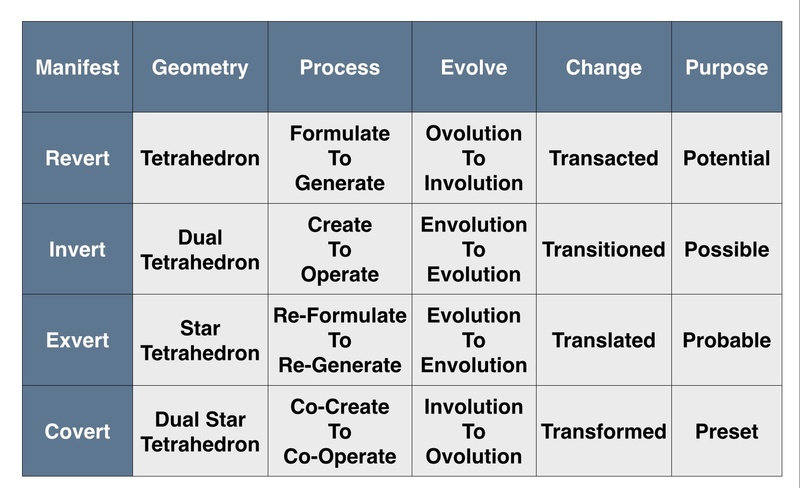 The terms ‘Ovolution’ and ‘Envolution’ are new terms that have emerged while developing the Meta Model of Process. The Quadruple Bottom Line : Or Why Not Feed Your Heart, Soul, Mind & Body? “It’s life. Life is bigger than you, if you can imagine that. Life isn’t something that you possess; it’s something that you take part in, and you witness.” Louis C.K. At the close of 2013 I made the choice to invest in Meeco, an exciting for-purpose technology start-up. Meeco is a new and easy way to manage your digital life and claim personal sovereignty….but more on Meeco later. For some time it has frustrated me that both my own Enterprise, Present Group and the School Volunteer Program, another Enterprise where I serve as Non Executive Director are termed ‘For Profit’ and ‘Not For Profit’ respectively, when both are first and foremost ‘For Purpose’! At a recent Conscious Capitalism gathering of advocates, Jo Hunter of Pollen Strategy very succinctly captured the shift in consciousness that has emerged in recent years. Jo is very much ‘For Purpose’. Her work supports the holarchy of economy, society and ecology (environment), which must become integral if we are to sustain our selves and future generations to come. New Money Thinking: Unified Consciousness as Holarchy. Jo definitely walks her talk by deciding what is ‘enough’ for her chosen lifestyle and any excess is paid forward to causes close to her heart. Even more compelling is her appreciation that a ‘For Purpose’ consciousness removes the notion of competition and replaces it with a more fulfilling promise of cooperation. Jo offers to teach anyone interested in learning her consulting offerings. As a result, if they then perform and deliver her services effectively, even to the point of eclipsing her business, she considers this simply an opportunity to witness her purpose unfolding at an enhanced rate. In my view, this purposeful insight is inspiring and makes the old money belief in ‘For Profit’ and competition sound almost medieval in comparison to a marketplace of cooperation. This quote frames the concepts of heterarchy and holarchy, which are emerging as key concepts in this era of a new consciousness. 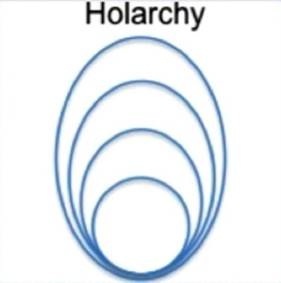 However, to understand the significance of holarchy let’s first explore historarchy and hierarchy and the resulting consequences. Historarchy: Separated in Both Time and Space. 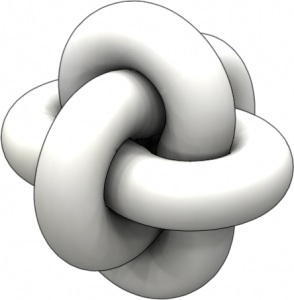 Historarchical structures appear in organisations fundamentally lacking in trust. The power resides in the subjective perspective of an autocratic leader. Individuals are rendered dependent since the power to decide resides with the leader or boss. Often this impairs an organisation’s ability to function and not surprisingly results are poor for society. 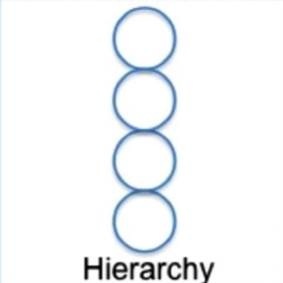 Hierarchy: Separate in Space NOT Time. With the introduction of trust rules can be externalised, objectivity is possible and hierarchies form; operating independently of the leader. However if the trust is conditional then individuals behave in accordance with the rules. Written instructions in the form of procedures to follow and proformas to complete become the order of the day. This is more effective than a historarchy in that separate teams can now operate simultaneously, subject to conformance. Hierarchical cultures are by necessity bureaucratic. They function well in a steady state but are slow to respond to opportunities and challenges or change in general. They also lack humanity and so sap the soul, hence their societal contributions are average at best. Heterarchy: Combined in Space and Time. When trust is offered, individuals have the opportunity to change the rules based on the authority of their role. If individuals act for the greater good of the whole – as apposed to their own interests – then an interdependent culture will begin to emerge. This offers a competitive advantage, since agile teams can continue to combine and align to meet challenges and opportunities. Such cultures are by necessity proactive and can make societal contributions deemed to be in the best interest of a wider group. And when we finally arrive at trust at all levels, animated with a unifying imperative – we have holarchy. This shared and unified purpose leads to a full release of discretionary effort and commitment to the cause like no other. Holarchy embraces all that has gone before it and is something else in and of it’s own creation. Such a culture is generative and will innovate towards greatness. This approach may well change the world for the better in the process. Each of the stages in raising consciousness retains the properties of those before but with the addition of some more functional complexity and so this process can be considered envolutionary. It is worth noting that the last stage of envolution from a democratic heterarchy to a meritocratic holarchy will mean that something is left behind; the new vantage point that Einstein describes provides the understanding of what element no longer serves the new order. For example when consent has becomes the highest form of consciousness for individuals operating democratically, then we come to understand that good is indeed the enemy of great. For conventional wisdom held by the majority may well vote down the exceptional wisdom held by a committed minority? This thinking is the threshold that must be crossed to move to unification which results in holarchy and manifests as meritocracy. Autocrats and meritocrats may look the same from the outside as they both appear to act seemingly without concern for rules or consent. 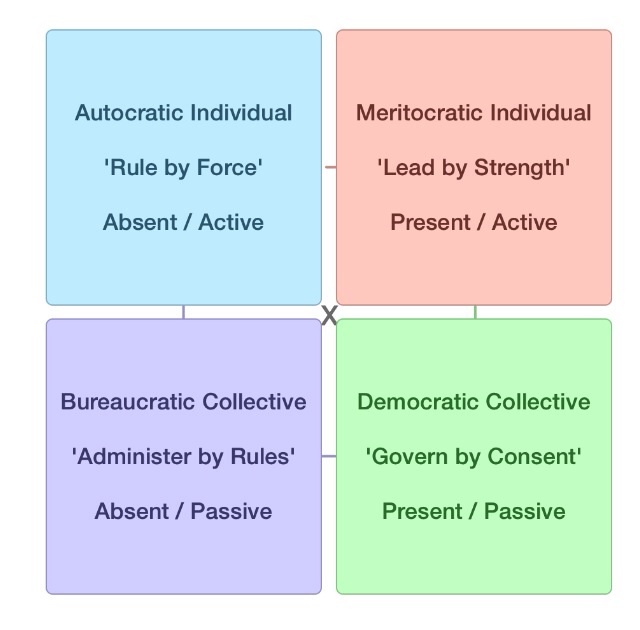 However, it is worth understanding the relationship between the first level of autocracy and the fourth level of meritocracy as the difference is vital. Autocrats solely serve their own agenda while a meritocrat has a vital understanding that service is to a collective good. This relationship can be seen in the third century ‘Axiom of Maria’ which is a precept: “One becomes two, two becomes three, and out of the third comes the one as the fourth.” Marie-Louise von Franz built on this insight through her collaborative work with Carl Jung and offered the alternate version; “Out of the one comes two, out of two comes three, and from the third comes the one as the fourth. 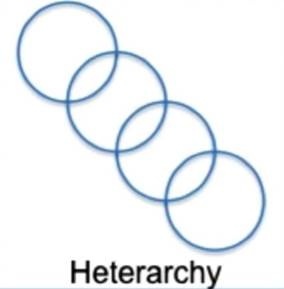 At Present Group we are evolving a quadruple bottom line as a way of moving towards a meritocratic culture. Our holarchy approach starts when we ask ask our people to focus their efforts across planet, people, purpose and profit. It starts by individuals mindfully considering these questions. – Planet: How can I make a real difference? – People: How do I contribute to true fellowship? – Purpose: How can I experience meaningful success? – Profit: How do I co-create abundance for all? This brings me full circle to my last post on ‘The Fourth Order Effect’ – which explored why personal sovereignty is emerging as the crucial unifier in the envolution of the internet. At the time I omitted to mention the Meta Tags of heart, soul, mind & body that have permeated our work on the Meta Model from the beginning but they are extremely important when it comes to personal sovereignty. For example if personal sovereignty (heart) is the Internets Forth Order Effect unifying the other three of Send (body), Search (mind) and Social (soul). These insights led us to explore for-purpose ventures in the technology sector. We see technology having a profound positive as well as negative impact on society. We were also looking for the right opportunity to be venture custodians rather than venture capitalists by paying forward support to help fund and support another enterprise in the joint venture space that would compliment our own aspirations. Following the Snowden revelations we had become increasingly aware of the surveillance economy. Over 80% of our on-line activity is tracked and sold by data brokers and third parties, often without our consent or knowledge. Furthermore, today’s dominance of social networking enterprises aggregating and selling our personal data, feels like we are having our souls stolen and sold back to our bodies via IPO’s. So we started to research the personal data sovereignty movement. We where interested to see who has the heart and commitment toward a meritocracy that will champion our personal sovereignty? Who is thinking of the generations ahead? Who is focused on disrupting enterprise through innovation? Who is imagining new business models together with new ways to create value? We found all this and more with Katryna Dow, and the company is Meeco. I would describe Katryna as a boundary rider. Her unique perspective gets personal sovereignty at a cellular level. Imagine as she does, the role of our generation to be real and symbolic guardians in the digital era. How our actions will pay forward sovereignty and freedom for generations to come. Katryna and the team at Meeco have devised and built a simple and elegant way to gain control of your digital life and make the things you do on-line safer and easier. “It’s your life. It’s your data. You own it”. We are proud to be a Joint Venture Partner of such an auspicious purpose. We are inspired by our shared values, which from Meeco’s perspective can now be carried into the digital world. – Profit: Enabling people to become the beneficiaries of what is theirs. Through Meeco we were also introduced to the great work of Respect Network. I recently had the privilege to meet Drummond Reed the Co-founder and CEO. For the past decade Drummond and his team have been co-creating with their foundation partners a positive alternative to the current data eco-system. The five Respect Network Principles of Promise, Permission, Protection, Portability and Proof speak to the emergence of new people centric terms and conditions; terms which put privacy and respect at the heart of every exchange. We believe the Respect Network will enable the shift and Meeco will allow us to engage in ways that create value real value for our families and ourselves. Meeco and Respect Network give us a voice to ask for a return to privacy and the right to transact on our terms. They are contributing to a growing community where integrity and respect are the cornerstones of new ways to create and exchange value. We invite you to join us in this exciting quest. This article was written by Brian Grimmer CEO of Present Group, with insights and understandings derived from extensive cooperation with Peter Midgley, CXO of Present Group, on the Meta Model for Process. 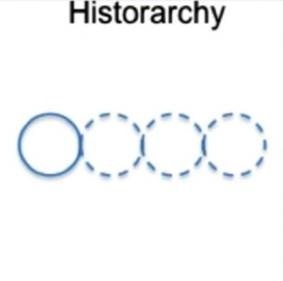 The term ‘Historarchy’ is a new term that has emerged while developing the Meta Model for Process.